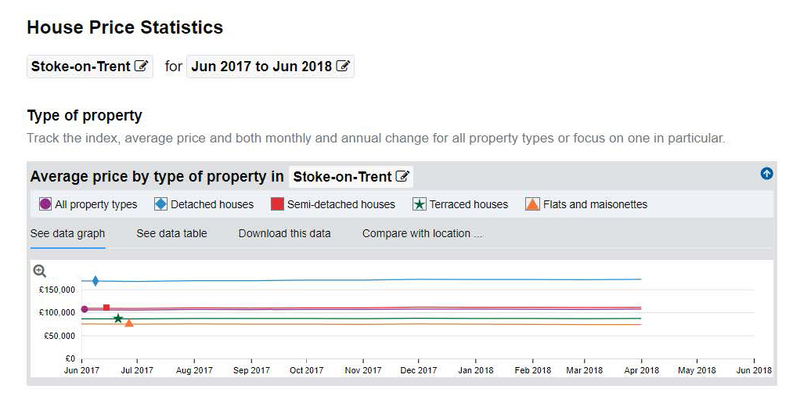 What's happened to house prices in Stoke-on-Trent? As flat as flat can be! Like most other home owners in Stoke-on-Trent, I am eagerly awaiting the return of capital appreciation! When will my house price rise? When will my rental property increase in price so I can release some equity and buy another? Not yet, I'm afraid. If you have bought your property in the last 10 years, like me, you will be as frustrated as I am! We see property prices going up in other parts of the UK, but here in Stoke-on-Trent, prices are the same as they were 12 months ago. That's according to official data from the UK House Price Index from HM Land Registry. I know, I know, people say prices are going up because they see prices going up on Rightmove, Zoopla or On the Market. Let's not be fooled. Those are just advertised prices. Many agents win work by giving people unrealistically high "valuations". These here are real prices from recorded sales. I'm no statistician or economist but here is the graph that explains it all. Looking at the graph, prices are flat. Actually flats and maisonettes are dropping. It's a slight drop in the line, but it's there. Stoke-on-Trent is not quite the flats and maisonettes place as our bigger cities. So beware that those (especially new build flats) tend to be resold at a lower price than the new price. You can check out what I mean by looking at prices in the Manchester Court development in Burslem. Many flats are being resold at around £50,000 when the new prices were £100,000. Speaking of new-builds, also look at the Johnsons Wharf development in Hanley. New prices for the semi-Ds around 10 years ago were about £150,000 but today they are more likely to fetch £130,000. That's also only if a buyer would rather buy a second hand one than a brand new one being built down the road with all its guarantees and warranties. I have met several homeowners who are desperate to sell but can't do so because of the negative equity. So buy wisely and sell wisely. In times of flat prices, it doesn't mean we shouldn't sell and move on. It means we should be realistic on price. We should buy houses that will at the minimum retain its value. We should be careful on what we spend renovating a house. Not all houses will fetch a higher price just because they are renovated or refurbished. Location is important. Better neighbourhoods can tolerate an extra £20,000 to a sale price when a house is refurbished beautifully. Many other neighbourhoods in Stoke-on-Trent can't. So if we want to "get our money back", it's important to check the prices on your street, find out the ceiling price of houses like yours on that street and then budget accordingly. Your purchase price + renovation costs should be less than that ceiling price, to stand any chance of getting your money back.